If you've decided to have an outdoor wedding, congratulations! Outdoor weddings are romantic and beautiful. However, they aren't as easy as they may look. Outdoor weddings come with additional caveats and pitfalls, but if you follow these tips, you'll be sure to shine on your wedding day. Think about what the weather will likely be at the time of day and month of the year of your outdoor wedding. Sunny and hot? Don't leave your guests uncomfortably melting – have your ushers give guests ice-cold bottles of water as they are seated. Consider printing your wedding program on a fan so that guests may cool themselves. Don't forget to have plenty of sunscreen on hand as well. For a very warm location, look into renting large electric fans (don't forget a generator) and/or a tent to shade the sun's rays. If it will be cold and damp, make sure you tell guests that so they can wear extra layers. A simple xeroxed insert will do. You might want to have lap blankets on hand or rent portable heaters. What will you do if it rains? The ideal outdoor wedding location has an indoor location waiting just in case. Many brides and grooms opt to have their ceremony outside and reception inside. In a pinch, the tables can be scooted to the back of the room during the ceremony. A tent is another option, but only for light to moderate rain storms. Heavy rain will soak the ground underneath, leaving guests with soggy and muddy shoes. Make sure any tent you rent is sturdy so it won't flip over, and that it has thick and weighted sides. Many outdoor weddings suffer from windy conditions. Avoid light fabrics like chiffons and china silks in your dress and the bridesmaid dresses. Tell your hairstylist that you'll be having an outdoor wedding so she/he can plan a style. Men in the wedding party should use pomade or other styling product. Again, tell your guests in a printed insert so that they can plan accordingly. And of course, make sure your tent will stand up to gusting winds or find an indoor backup plan. When you picture your dream wedding at the beach, you're probably not hearing the roaring of the waves, the rushing wind, or the local kids running and screaming around you. Look into renting a sound system with clip mikes for the bride, groom, and officiant. Your DJ or band may be able to easily arrange this for you. 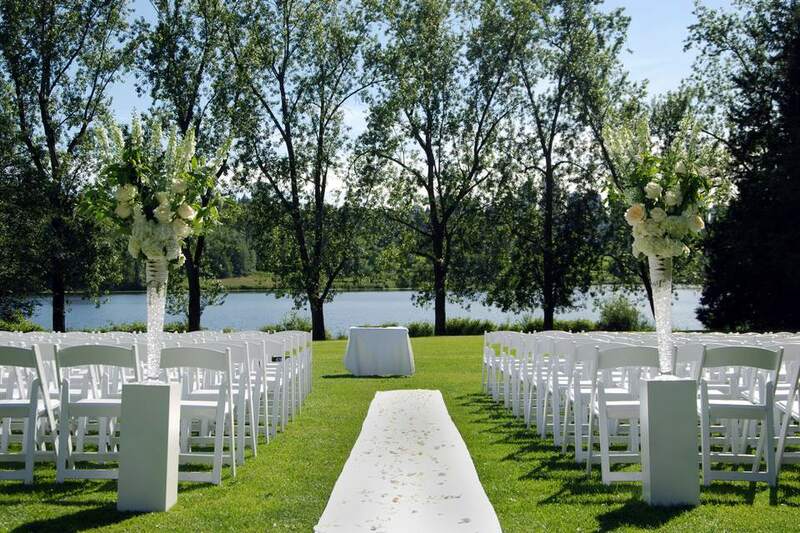 One of the bonuses of an outdoor wedding is the natural beauty around you, lessening your need to decorate. But you still need to do some work. Visit the site a week before your wedding to make sure the grass is mown, the ground raked, and the flowers have bloomed. If your wedding is at a public park, you may want to ask the groomsmen or friends to do this the morning of your ceremony. If it's been an especially cold season, you may need to supplement the flowers with some potted bulbs from a florist. Other decorations you may want to consider include an arch or trellis to focus the ceremony and frame the bride and groom as they say their vows; strings of lights or lanterns in the trees; luminarias; torches; or farolitas. Does your caterer have experience planning an outdoor wedding menu? Make sure they're planning things that will keep well outdoors in the heat. Avoid things like mayonnaise salads or dishes which must be served cold. Since alcohol is dehydrating, consider serving a variety of lemonades, teas, and punches. Be sure to have plenty of ice and water around as well. For a fancy cocktail, why not serve a classic mint julep or a mojito? The mint will refresh and cool your guests. Be sure to put out citronella candles or a bug zapper so that your guests won't spend the whole ceremony swatting at the air. Consider timing your outdoor wedding for sunset where your guests will see you take your vows surrounded by the warm glow of the sun. Those having a daytime outdoor wedding should orient the ceremony so that the sun will be on guests' backs rather than in their eyes. Don't forget to contact your city parks department or other local government to get a permit for an outdoor wedding. Be sure to ask about rules concerning trash removal, candle or torch lighting, and pre-wedding photography.